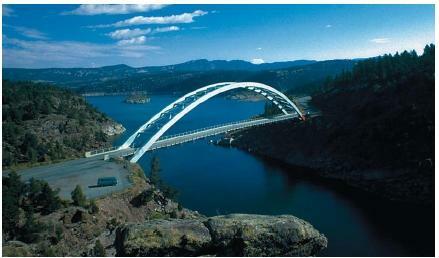 Bridges are structures that provide a means of crossing natural barriers, such as rivers, lakes, or gorges. Bridges are designed to carry railroad cars, motor vehicles, or pedestrians. Bridges also support pipes, troughs, or other conduits that transport materials, such as an oil pipeline or a water aqueduct. Humans have been constructing bridges since ancient times. The earliest bridges were probably nothing more than felled trees used to cross rivers or ditches. As civilization advanced, artisans discovered ways to use stone, rock, mortar, and other natural materials to construct longer and stronger bridges. Finally, as physicists and engineers began to develop the principles underlying bridge construction, they incorporated other materials such as iron, steel, and aluminum into the bridges they built. There are four major types of bridges: beam, cantilever, arch, and suspension. Three kinds of forces operate on any bridge: the dead load, the live load, and the dynamic load. Dead load refers to the weight of the bridge itself. Like any other structure, a bridge has a tendency to collapse simply because of the gravitational forces acting on the materials of which the bridge is made. Live load refers to traffic that moves across the bridge as well as normal environmental factors such as changes in temperature, precipitation, and winds. Dynamic load refers to environmental factors that go beyond normal weather conditions, factors such as sudden gusts of wind and earthquakes. All three factors must be taken into consideration in the design of a bridge. Abutment: Heavy supporting structures usually attached to bedrock and supporting bridge piers. Bedrock: Portion of Earth's mantle made of solid rock on which permanent structures can be built. Dead load: The force exerted by a bridge as a result of its own weight. Dynamic load: The force exerted on a bridge as a result of unusual environmental factors, such as earthquakes or strong gusts of wind. Live load: The force exerted on a bridge as a result of the traffic moving across the bridge. Piers: Vertical columns, usually made of reinforced concrete or some other strong material, on which bridges rest. Suspenders: Ropes or steel wires from which the roadway of a bridge is suspended. Truss: A structure that consists of a number of triangles joined to each other. The simplest type of bridge consists of a single piece of material that stretches from one side of a barrier to the other side. That piece of material—called a beam or girder—rests directly on the ground on each side or is supported on heavy foundations known as piers. The length of a beam bridge is limited by the weight of the beam itself plus the weight of the traffic it carries. Longer beam bridges can be constructed by joining a number of beams to each other in parallel sections. A cantilever bridge is a variation of the simple beam bridge. A cantilever is a long arm that is anchored at one end and is free to move at the opposite end. A diving board is an example of a cantilever. When anchored firmly, a cantilever is a very strong structure. It consists of three parts: the outer beams, the cantilevers, and the central beam. The on-shore edge of the outer beam is attached to the ground itself or to a pier (usually a vertical column of reinforced concrete) that is sunk into the ground. The opposite edge of the outer beam is attached to a second pier, sunk into the ground at some distance from the shore. Also attached to the off-shore pier is one end of a cantilever. The free end of the cantilever extends outward into the middle of the gap between the shores. The cantilevers on either side of the gap are then joined by the central beam. To build bridge piers, workers need a water-free environment to excavate or dig the foundations. This is achieved by using a caisson, a hollow, water-tight structure made of concrete, steel, or other material that can be sunk into the ground. When building a bridge over a river, workers sink a caisson filled with compressed air into the river until it reaches the river bottom. The workers then go into the caisson and dig out soil from the riverbed until they come to bedrock. The caisson, which has sharp bottom edges, continually moves downward during the digging until it comes to rest on bedrock. Concrete is then poured into the caisson to form the lowest section of the new bridge pier. Trusses. The strength of a cantilever bridge (or any bridge) can be increased by the use of trusses. A truss is structure that consists of a number of triangles joined to each other. The triangle is an important component of many kinds of structures because it is the only geometric figure that cannot be pulled or pushed out of shape without changing the length of one of its sides. The cantilever beam, end beams, and joining beams in a cantilever bridge are often strengthened by adding trusses to them. The trusses act somewhat like an extra panel of iron or steel, adding strength to the bridge with relatively little additional weight. The open structure of a truss also allows the wind to blow through them, preventing additional stress on the bridge from this force. The main supporting structure in an arch bridge is one or more curved elements. The dead and live forces that act on the arch bridge are transmitted along the curved line of the arch into abutments or supporting structures at either end. These abutments are sunk deep into the ground, into bedrock if at all possible. They are, therefore, essentially immovable and able to withstand very large forces exerted on the bridge itself. This structure is so stable that piers are generally unnecessary in an arch bridge. if the roadway is above the arch, by ropes or cables (suspenders) if the roadway is below the arch, and by some combination of the two if the roadway is somewhere within the arch. In a suspension bridge, thick wire cables run across the top of at least two towers and are anchored to the shorelines within heavy abutments. In some cases, the roadway is supported directly by suspenders from the cables. In other cases, the suspenders are attached to a truss, on top of which the roadway is laid. In either case, the dead and light loads of the bridge are transmitted to the cables which, in turn, exert stress on the abutments. That stress is counteracted by attaching the abutments to bedrock. The towers in a suspension bridge typically rest on massive foundations sunk deep into the riverbed or seabed beneath the bridge itself. The wire cables that carry the weight of the bridge and its traffic are made of parallel strands of steel wire woven together to make a single cable. Such cables typically range in diameter from about 15 inches (38 centimeters) to as much as 36 inches (91 centimeters). Traditionally, three kinds of movable bridges have been constructed over waterways to allow the passage of boat traffic. In a swing bridge, the roadway rotates around a central span, a large, heavy pier sunk into the river bottom. In a bascule bridge, the roadway is raised like an ancient drawbridge. It can be lifted either at one end or split in two halves in the middle, each half rising in the opposite direction. In a vertical-lift bridge, the whole central portion of the bridge is raised straight up by means of steel ropes. hey, im doing a project about bridges and i found your information very helpful, especially the deffinitions. i still have a lot more of my project to do and i dont know all the answers for the questions, if you can maybe help me out it would be great. if you can e mail me at kayla.rawlins@hotmail.com and i can ask you a few questions. great site ! Thank You for the information helped alot on my bridge point design project. this should definitely help me on my bridge powerpoint for physics. Thanks :P! I found this information really useful for my assignment and by the way i go to rangeview intermediate. In charge of a small NGO in Madagascar I need help to design a 360 meters long wire bridge to ferry small loads (250 - 300 kgs) such as systems used in Nepal. If my friend did not tell me about this site i would be talking to a computer *fingers crossed i pass mbridge project*. I think this website is a great way to learn about bridges. It is perfect for my "Math Building Bridges Project" at my school. We are using this information for a bibliography and need the author of this information and the publisher and when it was published. Could you help us with this, we would really like to reference this good information. I hope someone can help me understand how vectors come into play when building a(n) truss arch bridge, can someone email me a link please, and thank you for the valuable info on the page! Thank you soo much!! This helped me alot with my essay! Thank you, this helps a lot and I need this for my project .